Setting off on a three day jaunt across the Hill Country, we’ve decided to make the small town of Wimberley our first stop. This is a place we became quite familiar with during the years we lived in Austin. Back then, nearly 30 years ago, it was already a fun destination, in a thoroughly idyllic setting. Wimberley began as a small trading post in the mid 1800s. The settlement changed names several times until Pleasant Wimberley bought the local mill in 1874, after which the area became known as Wimberley’s Mill. When an application was submitted to establish a post office, the name was shortened to just Wimberley. 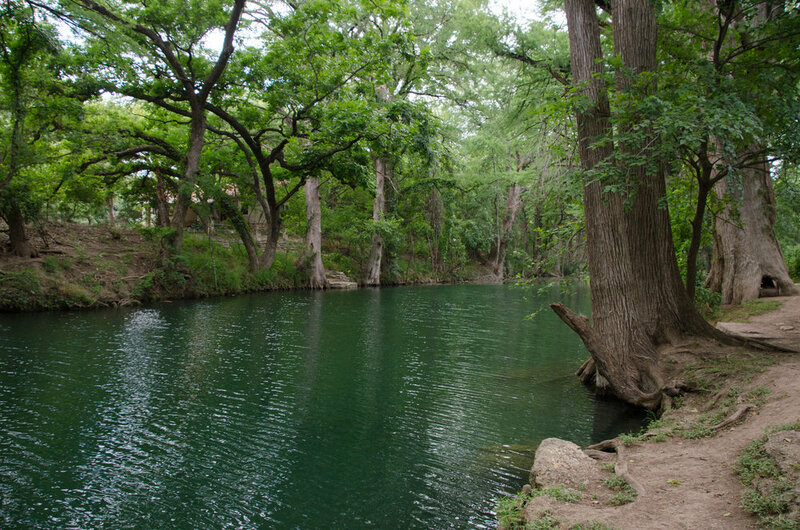 Wimberley is situated in a little nook between Cypress Creek and the Brazos River. The traditional grid system of roads that has been applied to cities and towns all across Texas is refreshingly absent here, which contributes to Wimberley’s old time charm. Our first stop in town is Blue Hole Regional Park. I’m interested in visiting because I’ve been here before. In the late 80s, Tim and I spent a weekend in Wimberley, visiting a good friend. She led us through fields, on the north side of Cypress Creek, to what is today Blue Hole. The area was slated for development a few years ago, until the city and residents decided to step in and buy the land in order to keep it in its natural state. Presumably, the expense of the undertaking made it necessary to find a way to recoup some of the money spent. The city turned the area into the 126 acre Blue Hole Regional Park. For those who would like to spend time in the cool water, the park charges a $9 per adult admission fee. Since we’re not interested in swimming, we decide to go for a walk along a trail that follows the ridge above the creek. We catch glimpses of the creek, but aren’t able to get any close-up views. It’s a little disappointing since I’ve been looking forward to reconnecting with that incredible sense of wonder I felt at seeing the creek all those years ago. Realistically, it’s still just as beautiful but it’s not the same place it was back then. Things change and sometimes, we should just be grateful for a beautiful memory. As we continue on the trail, my attention is drawn to the cocooning effect of the mesquite forest that surrounds us. The dark trees and low canopy makes me feel like we’re walking through the set of a fantasy movie. Knowing that we’ll be able to get a view of the creek in town, we’re soon back in the car and on our way. There’s not an abundance of parking space, but we eventually find a spot and set out to enjoy a stroll through an area that offers a nice mix of stores and restaurants. When we see an opening through the buildings that will allow us an up-close view of the creek, we choose to divert to the road not traveled, or at least, less traveled. Admittedly, the creek is not quite as picturesque in this area, but at least I’m able to walk along the water. 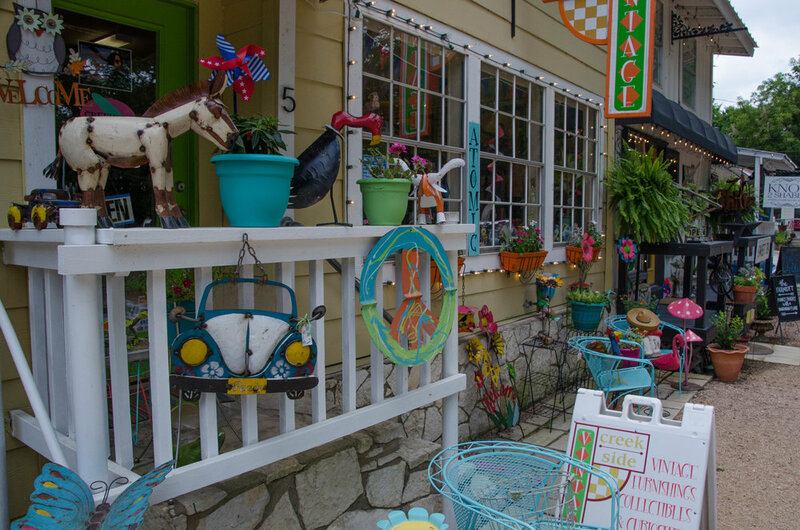 We return to the colorful stores and galleries in town and continue exploring until the heat of mid-day makes us wish for a cool place providing replenishing energy. There are plenty of places to eat in the main shopping area but I’ve already located a restaurant that seems likely to deliver a unique culinary experience. It’s not far away, but we go ahead and drive over anyway. 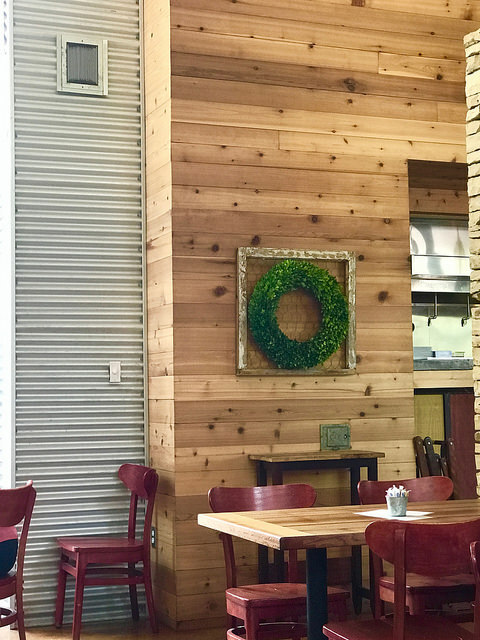 The Leaning Pear is owned by a Texan couple who, after spending some time in Italy and New York, returned home to establish an eatery based on fresh, seasonal, and local food. 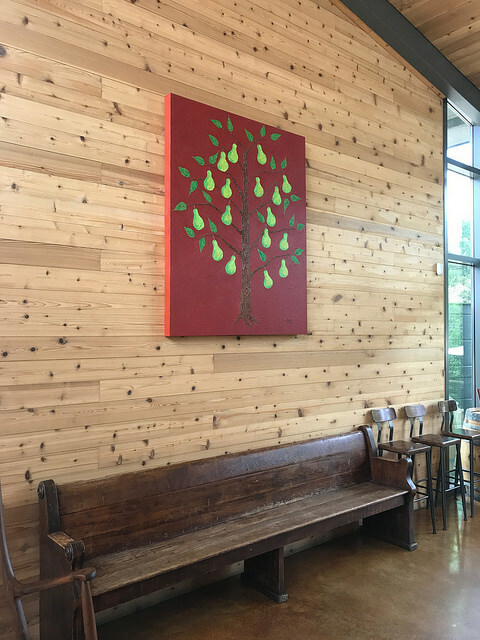 As someone who prefers to leave the table without a feeling of being weighed down, restaurants like The Leaning Pear are always at the top of my list when mealtime arrives. Unfortunately, as a staunch meat eater, Tim often finds himself searching the menu in vain after listening to me raving about what an amazing dining experience we can expect. 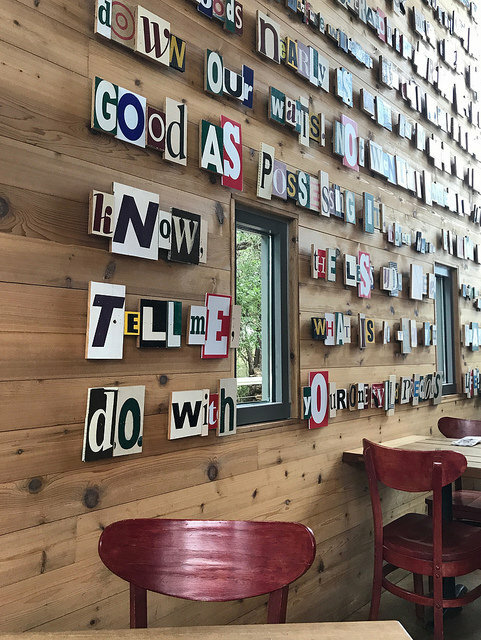 The menu at The Leaning Pear features a long list of healthy goodness, but very little that appeals to more carnivorous appetites. In sympathy with his unspoken disappointment, I suggest we share a pizza. Neither one of us is looking for a big meal. While planning the trip, I had initially considered spending the night in Wimberley. The town has a number of beautiful bed and breakfasts that I think would have offered a very unique experience. I would encourage readers to consider the option if considering a trip to this area. Fredericksburg will be the final destination on this first day of our trip. More on that later. 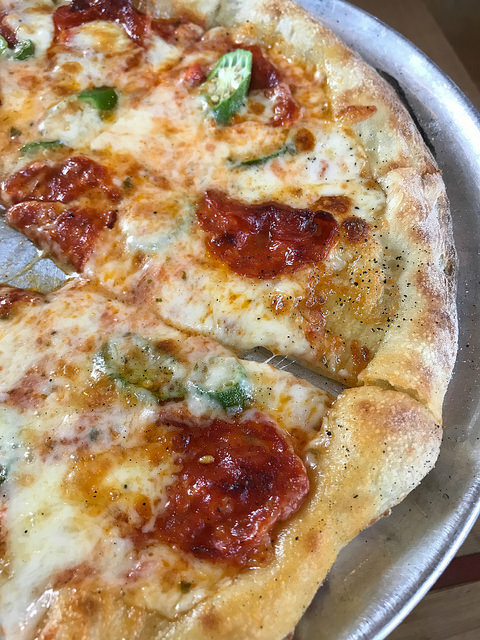 The next installment of this story will cover the places we visit before arriving in Fredericksburg. I hope you’ll check back in for Hill Country Part II.